Een Skoenlapper (One Butterfly) is a South African mystery thriller television mini-series created by Paul C. Venter and produced by Christopher Tree about an illegal oil drilling operation in Antarctica that unwittingly uncovers the fossil of a prehistoric butterfly that contains a virus so deadly it has the potential to destroy all of humanity. The series is predominantly in Afrikaans, with English subtitles. 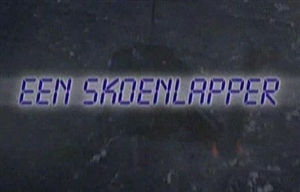 Een Skoenlapper originally aired on SABC2 from 4 July to 8 August, 2002. It later aired on SABC3. See "Seasons" below for seasonal broadcast dates and times. A rebroadcast of the series premiered on SABC2 on Tuesday 19 February 2013, at 19h30. New episodes broadcast weekly. There are six hour-long episodes in the series. Antartica, 2006: the international oil group Alpha Petrolium is drilling for oil illegally whilst their head, William Williamson (Graham Hopkins), is trying to convince the UN to lift the South Pole ban on the development of minerals. The death of a driller leads to an investigation by Dr Svetlana Bloem-Coetzee (Anriëtte van Rooyen) and microbiologist Braam Steenberg (Chris Voster). They discover that the worker was exposed to a strange virus possibly brought to the surface by the oil drilling process. Svetlana's husband, Gordon Coetzee (Hannes Brümmer) is in charge of Alpha Petrolium's secret South Pole project and he refuses to accept the story of a strange ice virus. The chief driller, Boompie Boomgaart (Eric Nobbs), doesn't know what to think. Braam and Svetlana discover that the strange ice virus originates from the fossils of a prehistoric butterfly. William Williamson refuses to believe that a strange virus has been discovered by their drilling. He sends his hired murderer (Ron Smerczak) to South Africa to stop Steenberg and Svetlana from using the fossils as proof. The South African head of the oil group, Niek Bloem (Lieb Bester), agrees with his son-in-law and right hand man Gordon Coetzee that Steenberg is on the wrong track and that Svetlana is being influenced by him. Svetlana's mother, Sofia (Elize Cawood) is not so sure. Williamson's hired murderer breaks into Steenberg's flat to destroy the fossil but hurt himself in the process. Braam tells Svetlana that the buterfly has been stolen. Williamson arrives in South Africa only to discover that his hired thug is critically ill.
Braam and Svelana believe that they may find some of the prehistoric butterflies somewhere in Africa, because Africa and Antartica previously formed a continent. Svetlana's mother offers to sponsor the search. The hired murderer is gradually getting worse and Gordon finally realises what is really wrong with him. Gordon wants to locate Braam and Svetlana in Central Africa and requests his mother-in-law Sofia to assist him. Steenberg and Svetlana in the meantime reach the cave where there may still be fossils of the prehistoric butterfly. Gordon and Sofia eventually succeed in finding Braam and Svetlana in Central Africa. Everybody realises that only one person has been able to survive the virus and they try to discover why. The show's music was composed by Louis van Rensburg with the title theme composed by Piet Grundling. The executive producer was Dalene Kotzé and the show was directed by Paul C. Venter. The production company was Christopher Tree. There are six hour-long episodes in one season. Rebroadcast details included.